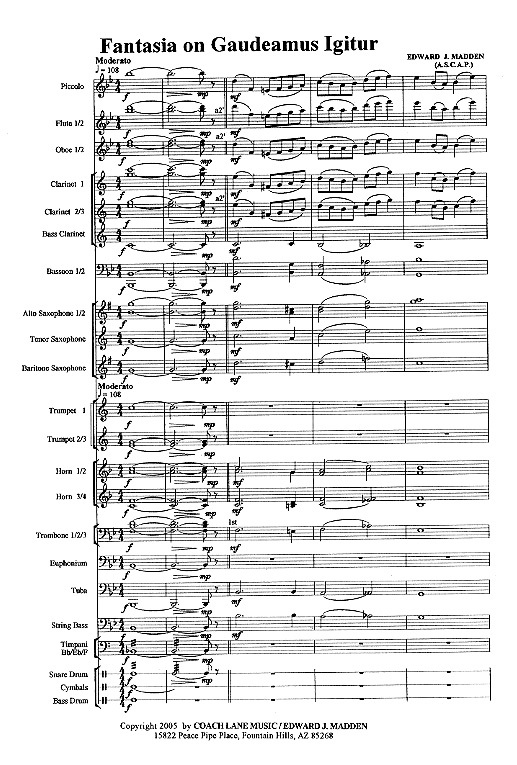 Compositions, Arrangements, and Transcriptions for the Modern Concert Band. For many of these pieces you can see a score sample and you have a choice of two audio samples, a short sample (quicker download- under 3MB) and a full length (between 5 and 20MB). Both are in mp3 format, and pop up in a new browser window. To exit that window, click the "X" in the upper right corner. These samples are meant for listening to compositions in the context of this web site. Using these audio files for any other purpose is strictly forbidden. CASTINE ($35.00 Gr. 2). 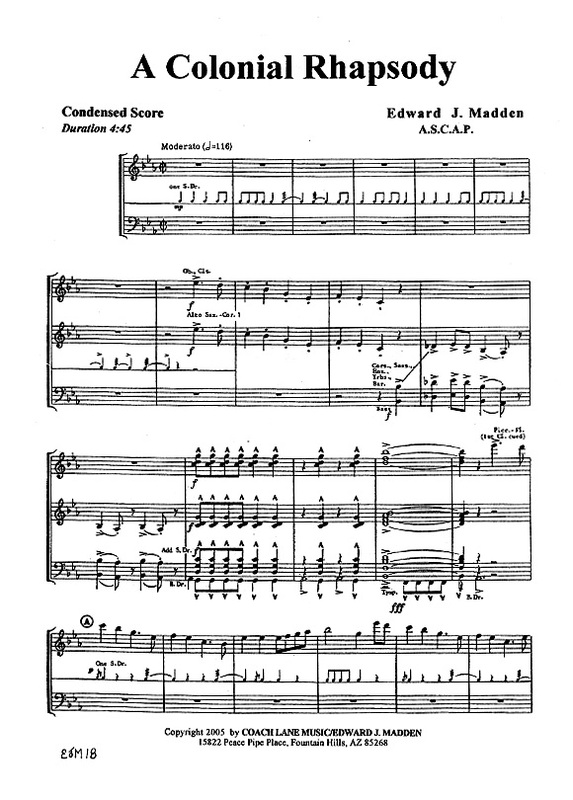 Commissioned by the Community Band of Castine, Maine home of the Maine Maritime Academy, an easy march introducing "Sailing, Sailing" in the trio. MARCH FESTIVO ($60.00 Gr. 3). Commissioned by the Southeast Massachusetts Music Educator's Association. New directions in form and harmonic substance. Powerful, reissued by the composer. MARCH LORRAINE (Louis Ganne) ($60 Gr. 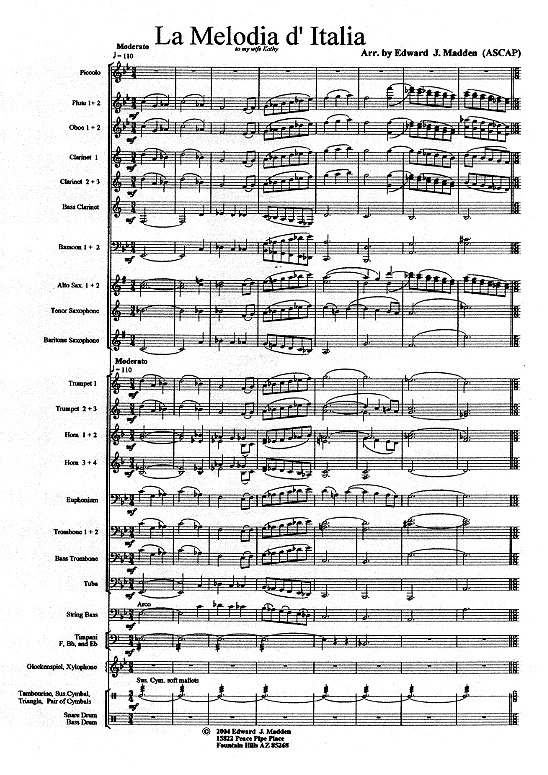 3) A new concert scoring of this world famous French march. MARCH SYMPHONIQUE ($60.00 Gr. 3/4). Premiered by the Boston University Concert Band, contemporary harmony, lines, and orchestration, a definitive work. Reissued by the composer. NOBLE SPIRIT ($50.00 Gr. 3). Created in the style of an English march with homage to Holst, Vaughn Williams, and Elgar, has sweeping melodies and traditional harmonic structure. RED RAIDERS CONCERT MARCH, THE ($80.00 Gr. 3). Dedicated to Spaulding High School, Rochester, NH, this sparkling new concert march features the sturdy tune of that school's Alma Mater in the trio; when repeated has a brilliant piccolo/flute obbligato. The final statement of the trio in a new key after a piquant silence is powerful! SIBO ($60.00 Gr. 3). (Pronounced Sybo, the Penobscot Indian name for river). Commissioned by the Hometown Band of the river city Brewer, Maine, engaging melodies, altered march form, not difficult, fresh and new! WAVERLY OAKS ($50.00 Gr. 3). commissioned by the Belmont, Massachusetts Middle School, a bright, sparkling very playable march with an engaging flute obbligato in the trio. ADAGIO FOR WINDS ($60.00 Gr. 3/4). Two folksongs; "I'm Just a Beggar and Poor Wayfaring Stranger" are juxtaposed in shifting major and minor Neo-Modal tonality, a beautiful musical contrast away from the band more flamboyant repertoire. Percussion is tacet. AFTERNOON OF A FAUN, THE ($85.00 Gr. 3/4). 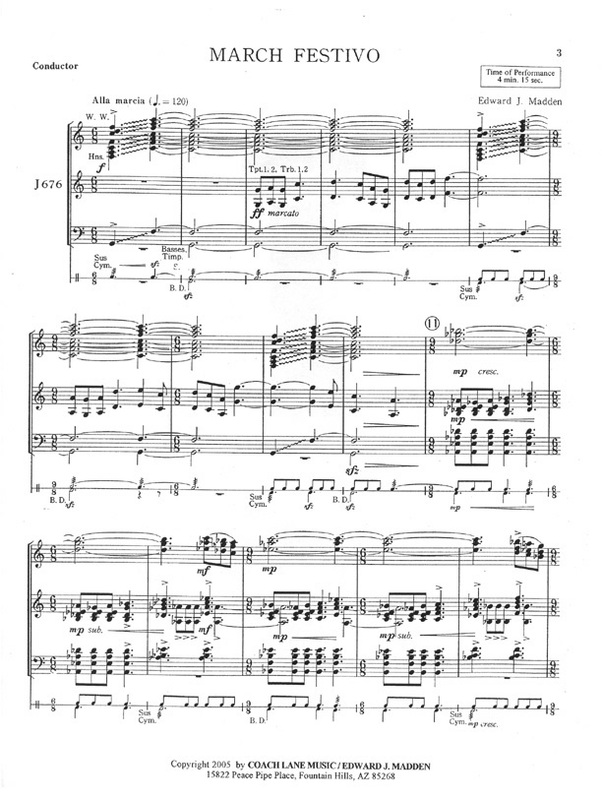 Debussy's towering masterpiece carefully and lovingly transcribed in full, pitch is lowered 1/2 step from his original orchestra score to "lay well" for winds, adjusted time signatures for easier reading, piano replaces harp, very playable. AMERICA ($35.00 Gr. 2/3). Commissioned by Carnegie Mellon University, a rich harmonic extended setting of this venerable anthem with 2 antiphonal solo trumpets. AMERICA THE BEAUTIFUL ($50.00 Gr. 3). Commissioned by Carnegie Mellon University, a more dramatic than usual extended setting with 2 part antiphonal trumpets, SATB chorus can be added. AMERICAN SPIRITUALS ($100.00 Gr. 4). Includes Swing Low Sweet Chariot, Nobody Knows the Trouble I've Seen, Down by the Riverside, and Rock -A- My Soul with incredible rhythmic vitality and rich harmonic texture. 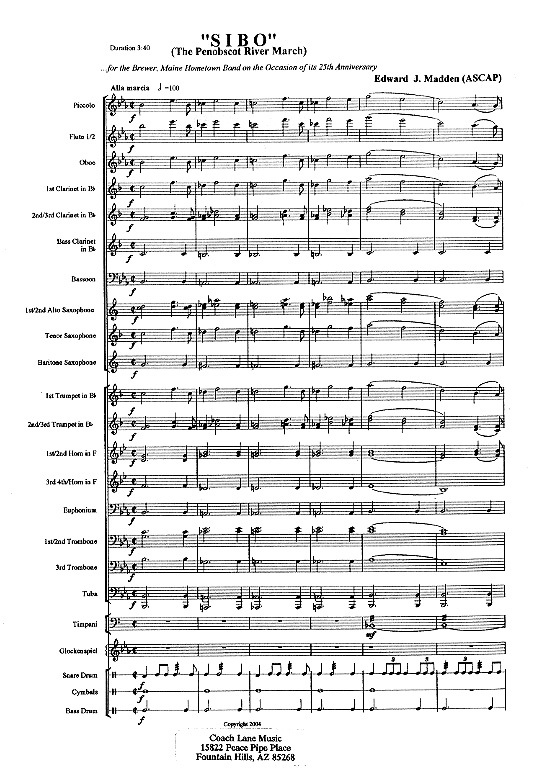 BATTLE HYMN OF THE REPUBLIC, THE ($50.00 Gr. 3). A brilliant arrangement of this beloved American song, the final statement"s powerful key change after a grand pause into the coda is positively thrilling! BERCEUSE, For Trombone Solo and Band ($60.00 Solo Gr. 3/4, acc. Gr. 2/3). Freely adapted from Goddard's "Jocelyn," an exquisite arrangement, lyrical solo, with a warm accompaniment. BOOK OF KELLS, THE ($100.00 Gr. 5/6). Commissioned by the Massachusetts. Institute of Technology Symphony Band, after the famous 9th century illuminated vellum codice of the Gospels at Trinity College, Dublin, Ireland, contemporary challenging music befitting the modern concert band. (a companion piece to DEIDRE OF THE SORROWS listed below). CAKEWALK FOR BAND ($50.00 Gr. 2/3). A delightful, lighthearted piece using the characteristic cakewalk rhythms, scored in alla breve for easier reading, a charming addition to any concert. CHAPARRAL ROAD ($100.00 Gr. 4/5). A tour de force symphonic concert piece with soaring melodies, modern harmonic texture and colorful orchestration is in expanded march form. Commissioned by the Scottsdale, AZ Concert Band, is marked by its exciting parts for all players. Duration: 6 minutes. CRADLE SONG, THE ($60.00 Gr. 3). Richly scored, this famous melody was created by Jonathan E. Stillman in 1837 using the words of Robert Burns's poem "Sweet Afton" naming his work "Flow Gently Sweet Afton." The melody was set later to the more familiar Christmas Carol "Away in the manger" by an unknown writer in the 19th century. It was known as "Luther's Cradle Song" appropriately programmed anytime of the year using either of these titles! COLONIAL RHAPSODY, A ($65.00 Gr. 3). This nationally known classic long out of print now reissued by the composer includes many tunes of the colonial era including "Chester" the unofficial marching song of the American Revolution. 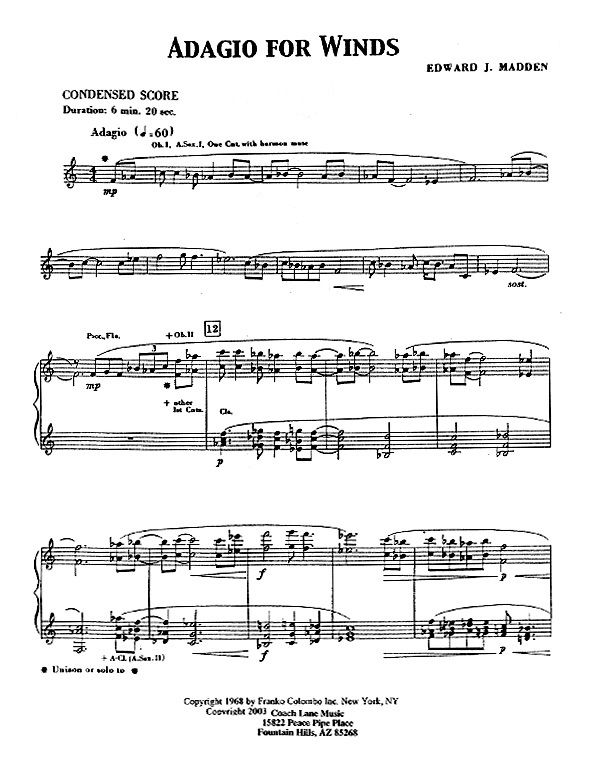 CONSOLATION (Mendelssohn) ($25.00 Gr. 2). Arranged for the young band, a very accessible score in chorale style adapted from the composer's piano cycle: "Songs Without Words". 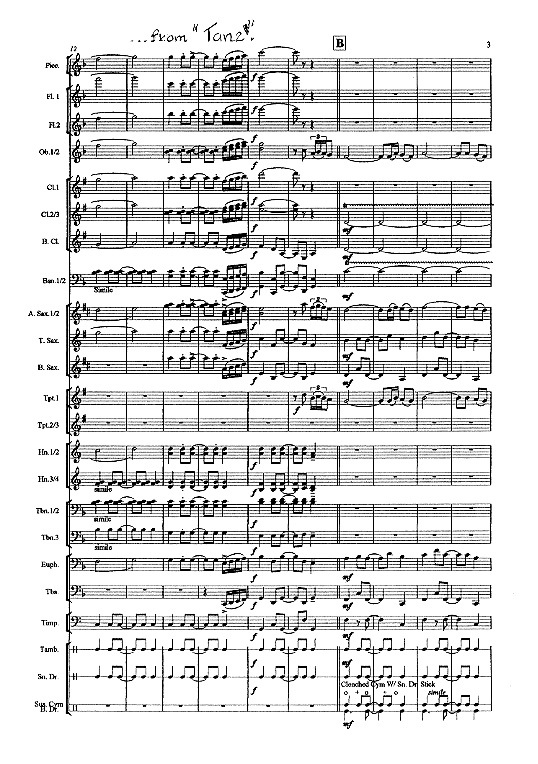 CZARDAS, For Trumpet, Clarinet, or Violin Solo (Violin uses the classic public domain print solo) ($65.00 Solo Gr. 4. acc. Gr. 3). The famous violin solo by Monte arranged and adapted with a new band accompaniment, a spectacular soloist showcase! DEIDRE OF THE SORROWS ($75.00 Gr. 5). After an ancient tragic Irish saga, this is a companion piece to THE BOOK OF KELLS listed above. Deirdre is a moving and plaintive lyrical work of polytonal colors and intense melodic lines. ELEGY Tuba Solo (Trombone or Baritone Solo 8va above) (75.00 Solo Gr4 Band acc. Gr3)...a quiet, contemplative work with tender interplay between soloist and band, Tuba, Trombone/Baritone solo parts printed back to back. Solo with piano accompaniment is also published. EVE OF SAINT AGNES, THE ($125.00 Gr. 4/5). After the poem by Keats, commissioned by the University of Tennessee at Martin, a towering work of descriptive invention in the realization of the vivid colors, imagery, ribaldry, and romance in the poem. Add piano, 2 flugelhorns, optional contrabass clarinet. FANTASIA ON GAUDEAMUS IGITUR ($75.00 Gr. 3/4). A stunningly brilliant arrangement on the old Latin tune beginning in a baroque style embroidered with florid counterpoint, which emerges into a modern contemporary showpiece in its final grandioso statement. FANTASIA ON A BELL CAROL ($60.00 Gr. 3). A band classic, the well known "Carol of the Bells" images the eastern European flavor of its Ukrainian melody source. Reissued by the composer. FANTASIA ON A FRENCH CAROL ($85.00 Gr. 3/4). Noel nouvelet known in America as "Sing We Now of Christmas" is first presented with canonic imitation and gradually developed with brilliant modal harmonies arranged to utilize the wonderful sonorities of the full concert band. Scoring includes optional piano or electric keyboard. Dutation 5:30. FIDGETY FEET ($100.00 Gr. 4/5). 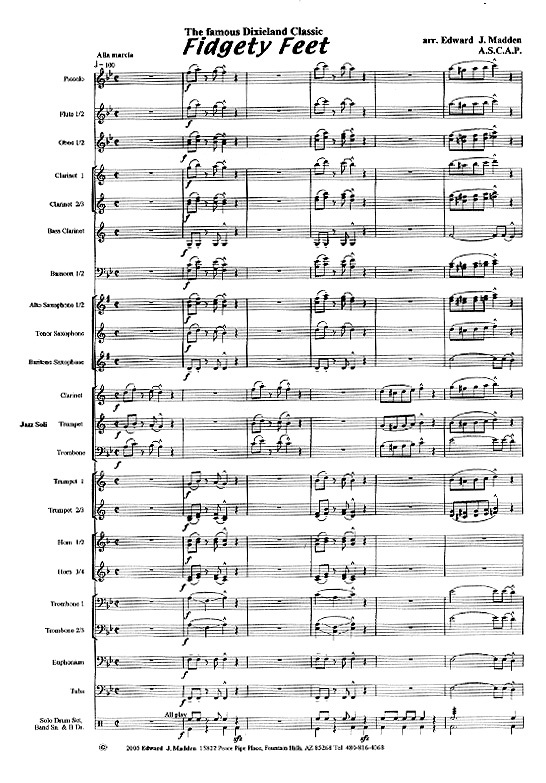 Commissioned by the Tempe Arizona Symphony Orchestra, newly transcribed for band, the classic Dixieland jazz standard has Clarinet, Trumpet, Trombone, and Drum Set soloists out front of the fully participating concert band, optional improvisations and the raucous "barrel house" ending will bring the house down A big delightful showpiece! FLUTES, FLUTES, FLUTES ($60.00 Solo Flutes Gr. 4 acc. Gr. 3). A lighthearted showcase for 3 or a multiple of 3 flutes, a colorful interplay between flutes and band includes a trio section which features the flute's beautiful low register. GOIN' WEST, AN AMERICAN PORTRAIT ($100.00 Gr. 3/4). Old western musically "painted" and scored to transport the listener to the plains, deserts, mountains, trials, tribulations, settlement, and the fascinating high adventure of the great old American West. GOSPEL TRUTH, THE ($40.00 Gr. 2/3). An easy piece to play in old gospel/rock style with instant appeal and striking melodic lines in standard "straight ahead" scoring. JAZZ ROCK SINFONIA ($75.00 Gr. 3/4). 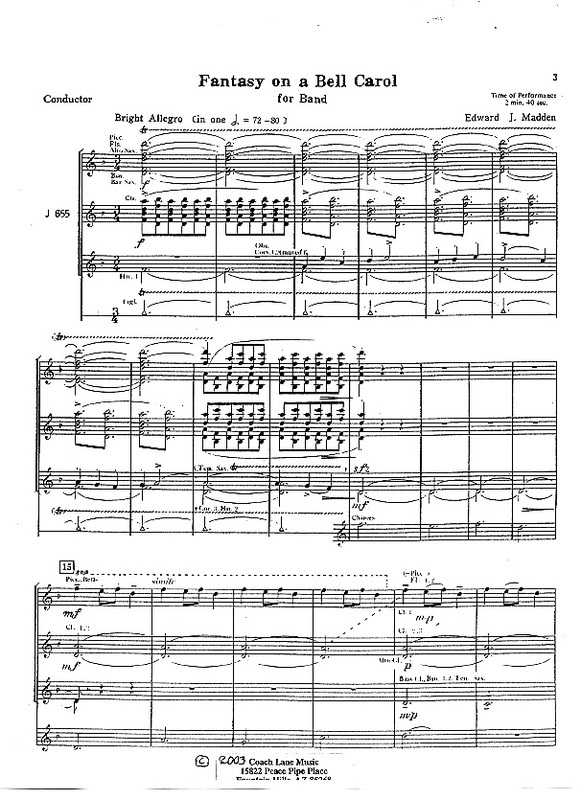 A rhythmic and harmonically rich symphonic movement in ABA form, includes a passage which can be performed with or without solo improvisation(s), strong either way. Reissued by the composer, formerly titled "Rock Movement." KINDERSONG ($75.00 Gr 3). Commissioned by the Castine Maine Community Band, a very lighthearted medley overture which includes 12 beloved children's songs, not difficult, very entertaining, and forever timely. LA MELODIA D'ITALIA ($100.00 Gr. 3/4). A romantic medley overture selection of the world's great Italian songs all set with gorgeous contemporary harmonies and orchestration ending with the rousingly energetic tarantella. LONDONDERRY AIR (Also known as "Danny Boy") ($40.00 Gr. 2/3). The universal Irish song in a new contemporary setting complete with the legendary climax, scored to allow the completely free interpretation of the conductor. Also available for String Orchestra. MIGHTY FORTRESS FANFARE, A ($50.00 Gr. band 3, soli trps 4). A chorale with four soli trumpets boldly announcing the opening of Martin Luther's famous hymn. The band plays the hymn in sustained choral style with the four trumpets in divided parts playing fanfare-like descants above. Its many uses would include a spectacular opening to a holiday concert. Duration 2:30 to 2:45 minutes, depending on your choice of tempo. NAUTICAL SUITE, A 1. Prelude 2. Ballade 3. Sea Chantey 4. Hornpipe. (Gr. 3/4 110.00) Commissioined by the Castine Arts Association and the Town Band of Castine, Maine on the occasion of the dedication of a large new granite monument entitled "Home and A way" by sculptor Bob Leverich at Castine's famous Wilson Museum. The monument and the music evoke the resident's spiritual home and the rich nautical history of one of the oldest seacoast towns in America. THE NATIONAL ANTHEM (The Star Spangled Banner) in Bb. ($40.00 Gr. 3). 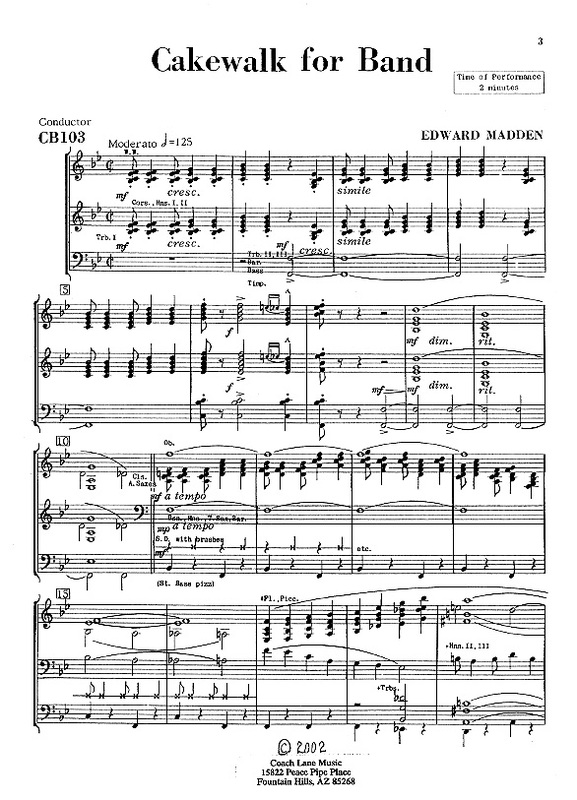 A spectacular and dramatic opening to a concert, more theatrical and richly harmonized than previous listing, scored in the manner of a crescendo with counter lines and a brilliant ending. OUR COUNTRY EAST TO WEST! ($100.00 Gr. 3 for each group. Band. SATB Chorus/Piano 1.90) This arrangement for SATB Chorus and Band of familiar old folk tunes is pure "Americana." It takes the listener from New England to Texas, across the wide Missouri River, Wyoming and the American Southwest ending with a grand statement of a new original patriotic title song. The lighthearted work invites the listener to enjoy a tunetul trip across the nation! Can be performed with as few as eight amplified singers or a large chorus. Wonderful for a spring concert! OUR OWN THING ($50.00 Gr. 3). A jazz/rock ballad with interesting ostinato rhythmic background, extra parts for guitar, bass guitar, and drum set are included, optional improvisation montuno passage is particularly idiomatic for guitar solo. ONE FINE DAY (Un bel di vedremo) ($50.00 Gr. 3/4) Soprano, Trumpet, or Violin solo (50.00 Gr. 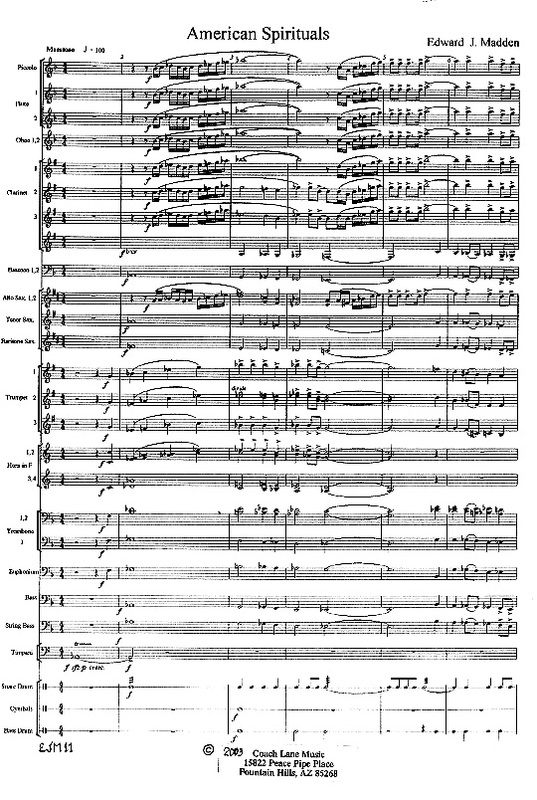 3/4) Puccini's famous opera aria from "Madame Butterfly" faithfully transcribed for woodwinds and horns only, in the original key of Gb. PRAYER OF THANKSGIVING ($50.00 Gr. 2/3). 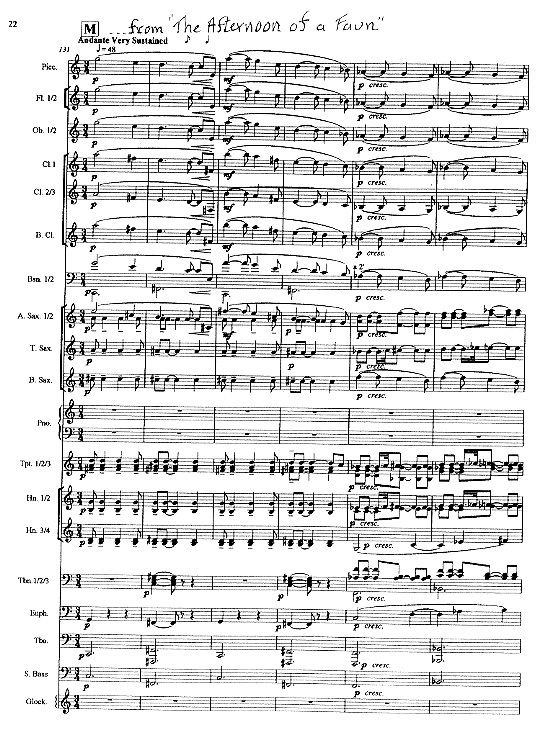 The wonderful hymn in statements freely arranged with an abundant tapestry of counterpoint wraps the famous melody in a colorful harmonic setting. SCOTTISH IDYLL ($100.00 Gr. 3/4). Universal Scottish melodies in a symphonic collage includes Bonnie Dundee, Loch Lomond, 100 Pipers (developed), Scotland the Brave, and others with Auld Lang Syne bringing the work to an emotional and stunning close. SEA PIECES ($125.00 Gr. 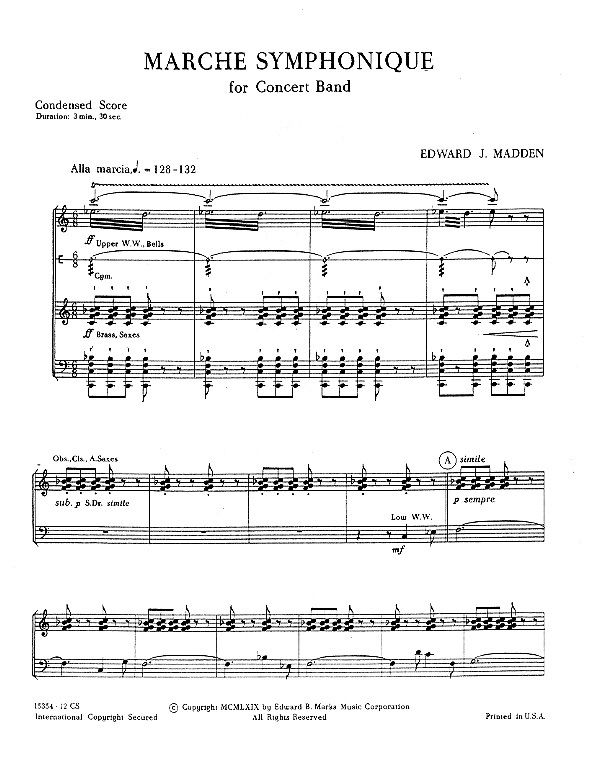 3 to 5) Edward McDowell's brilliant settings for piano written and published in 1898 by this first American composer significantly recognized in Europe, represent his conception of depicting moods rather than description. The eight pieces are unique romantic miniature masterpieces. 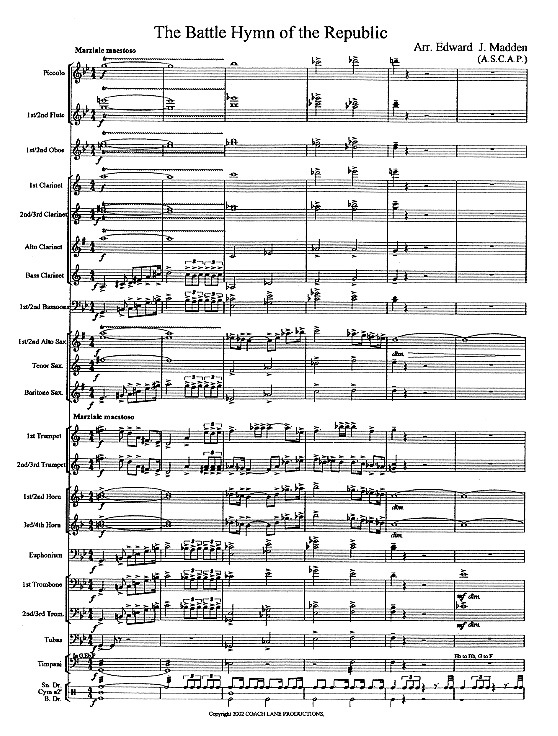 Now transcribed with rich symphonic orchestration, Sea Pieces is stunning music for concert band. Duration 17 minutes (with all 8 pieces are performed). The pieces can be performed singularly or in smaller groupings. SHIRIM ($100.00 Gr. 3/4) (Shirim, is the Hebrew word for songs)...an energetic, exciting medley overture of celebrated Jewish songs ending with the stirring universally known "Havah Nagila." as a finale and with its powerful dance energy, has never failed to thrill the band musicians and audience audience alike! SINFONIA FOR WINDS ($100.00 Gr. 4). Commissioned by the professional Colonial Band of Leominster, Massachusetts, in classic sonata ABA fast-slow-fast form, the andante center of the work is developed from short motifs, returning to the original spirited allegro and brilliant coda whice ends the work. STAR SPANGLED BANNER, THE in Ab. ($35.00 Gr. 2/3). 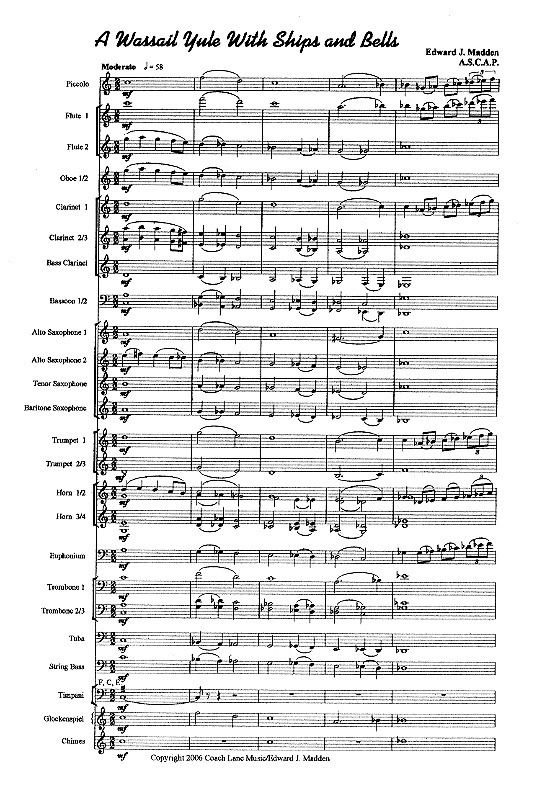 Commissioned by Carnegie Mellon University, an original, astute chorale type harmonization without ornamentation or "theatrics". 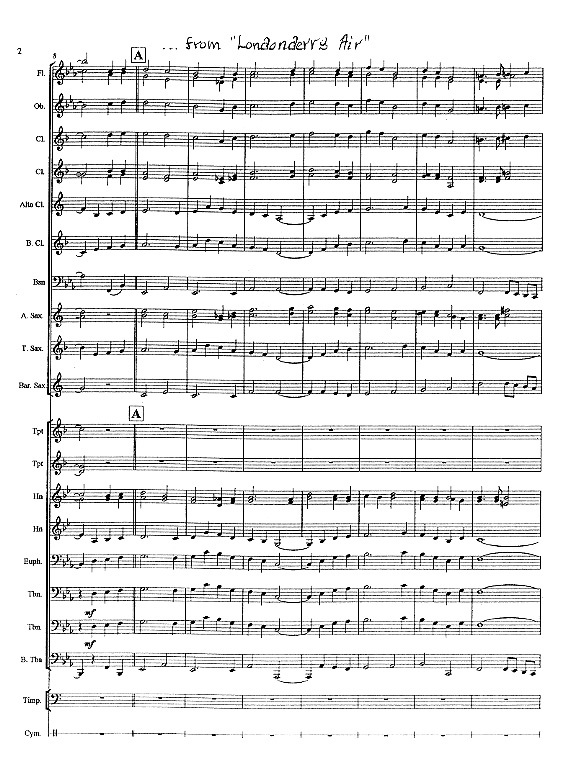 SYMPHONIC VARIATIONS ($125.00 Gr. 4). 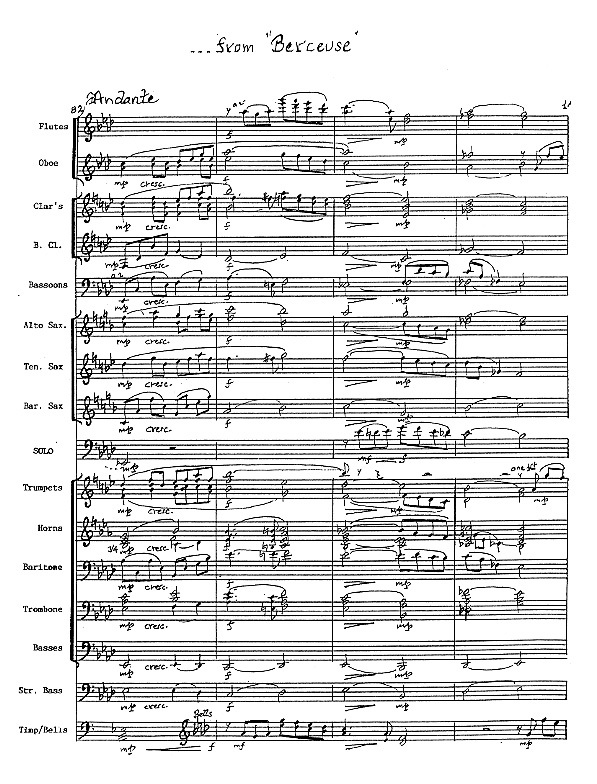 A modern, major work in three movements using the famous "Trumpet Tune" originally attributed to Henry Purcell displays the full tonal range of the concert band. Commissioned by North Hills High School Symphony Band. TANZ! a frailach for band ($100.00 Gr. 4). Similar to the hora, opening and closing with an old melody popularized as "And the Angels Sing", the work exudes the electric fury of a celebration dance in full up tempo swing! TOUCHSTONES, With narrator ($100.00 Gr. 3/4). 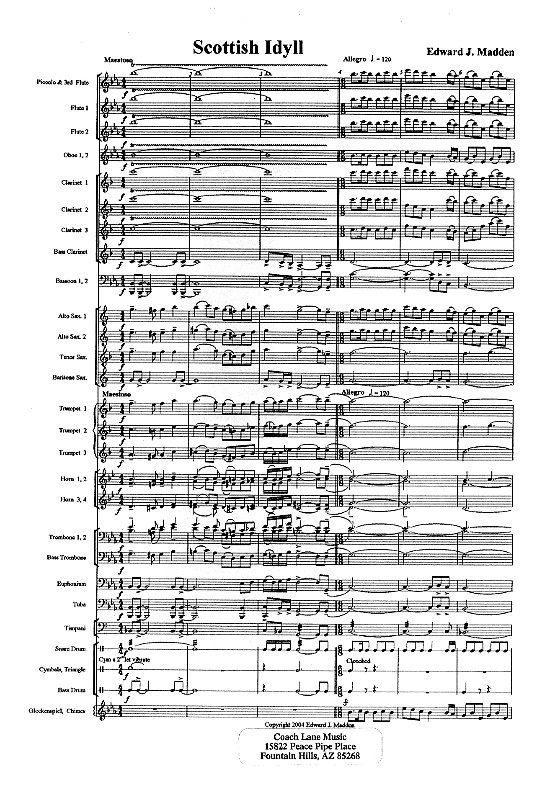 Commissioned by the Massachusetts Music Educators Association, premiered in Boston's Symphony Hall, symphonic in scope the score underlies and comments on text from statements on the arts by President John F. Kennedy, making a strong statement of affirmation on the importance of the arts in America. VICTOR HERBERT, A Bouquet of Love Songs in 3/4 Time (Gr. 3 100.00). 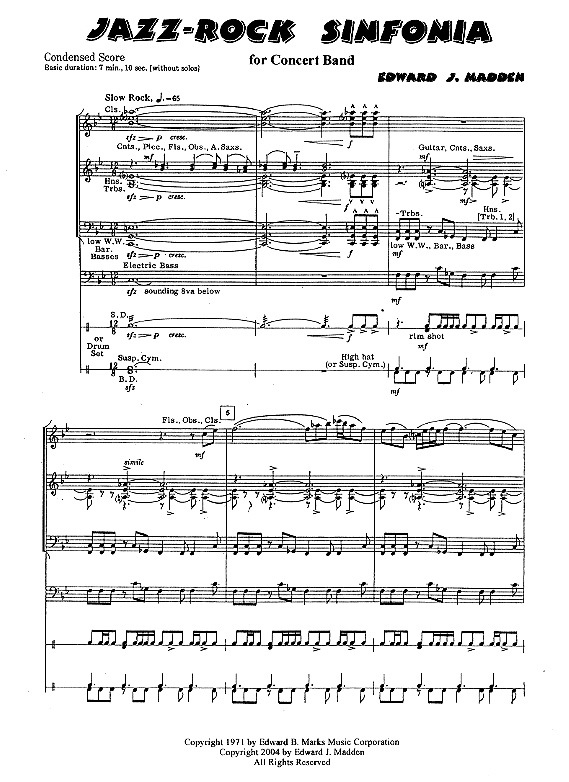 Four of Herbert's most famous love song melodies are included in this harmonically rich very playable arrangement: "Just A Kiss In The Dark" from Orange Blossoms, "Kiss Me Again" from Mlle Modiste, "I'm Falling In Love With Someone" from Naughty Marietta, and "When You 're Away" from The Only Girl. A great contrast to the music of J.P. Sousa his also famous friend and contemporary from the early 20th century. WASSAIL YULE, A With Ships and Bells ($85.00 Gr. 4). A fantasia on I Saw Three Ships, Good Christian Men Rejoice (In Dulce Jubilo), and The Wassail Song, the swinging lilt of these carols in 6/8 time with luxurious chords and florid counterpoint are designed to celebrate the joy of the holiday season.